I’ve spent July in British Columbia, Canada, attending a workshop and conference, and beginning the Canadian part of my DECRA research. Along the way I visited as many Chinese Canadian heritage sites as I could. Here’s a run-down of my trip. 4–5 July: 2-day ‘Cantonese Pacific in the Making of the Modern World’ workshop (invitation only) led by Dr Henry Yu at the University of British Columbia. Participants included Henry Yu, Glen Peterson (UBC), Evelyn Hu-DeHart (Brown University), Elizabeth Sinn (HKU), Shirley Hune (University of Washington), Selia Tan (Wuyi University), Jack Leong (Canada Hong Kong Library, University of Toronto), Yuet-sang Leung (HKU Press), Paul Macgregor, Michael Williams, and Zoe Lam (UBC). Thanks to Henry Yu, I received financial assistance from UBC to attend this workshop and was accommodated at St John’s College, UBC. 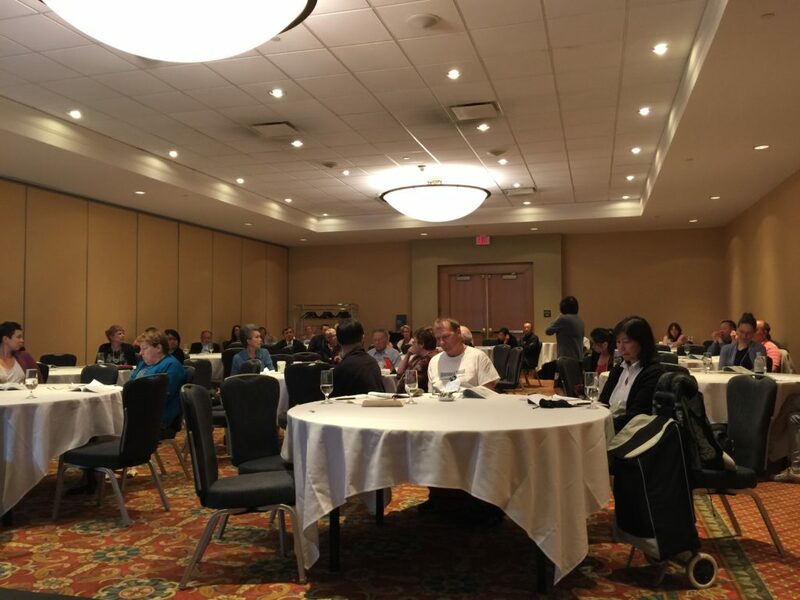 6–8 July: ISSCO 2016 conference convened by Henry Yu (UBC) and Glen Peterson (UBC), held at the Sheraton Vancouver Airport Hotel in Richmond BC. The conference was held over three days, with up to 6 parallel sessions and more than 200 participants. The papers included a mix of the historical and contemporary, and covered overseas Chinese communities in North America, Australia, UK, South America and the Carribean, and Southeast Asia. My paper was in the first session of the first day, so I was able to relax and enjoy after that. Two sessions that I particularly enjoyed were: the plenary session with Elizabeth Sinn and Selia Tan; and Panel 11: Intimacy, Class, Ethnicity and Power Inversion, with my UOW colleagues Cecilia Leong-Salobir and Claire Lowrie, Nadine Attewell (McMaster University) and Meg Foster (UNSW). 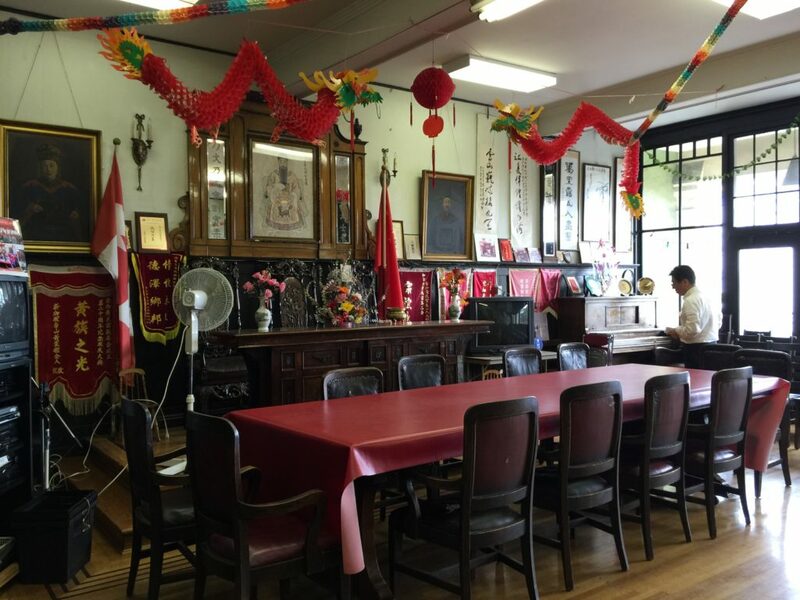 9 July: Chinese-Canadian Relations in Vancouver tour, organised by the Chinese Candian Historical Society of BC and led by CCHSBC president John Atkins and Sarah Ling. We visited the Musqueam Nation, where we were shown around by Elder Larry Grant and visited the ‘City Before the City’ exhibition at the Cultural Centre; had lunch at Floata Restaurant in Chinatown, the largest Chinese restaurant in Canada, complete with lion dance; visited the Wong’s Benevolent Association in Pender Street; and visited the Sun Yat-sen Classical Chinese Garden, the first classical Chinese garden built outside China (in 1986, two years before Sydney’s Chinese garden openened in 1988). 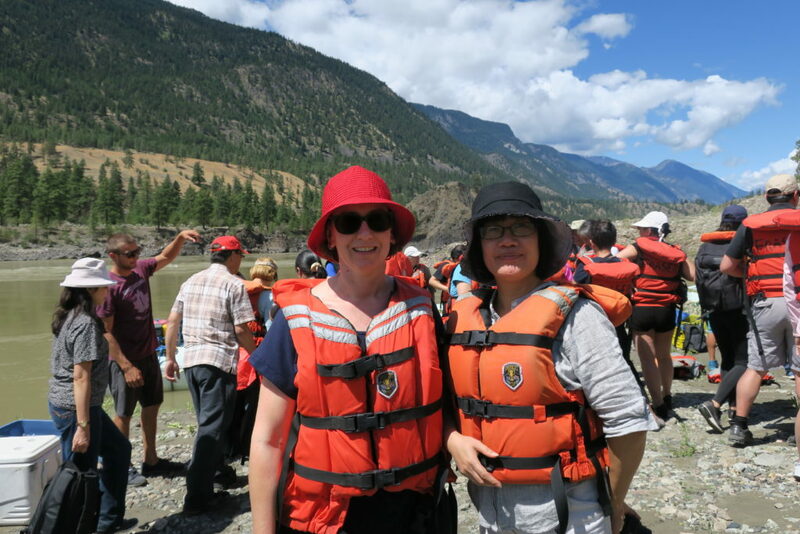 10 July: Gold Mountain River Raft Tour, facilitated by the Hua Foundation with tour coordinator Sarah Ling and UBC’s Henry Yu. We set out from Richmond around 7am for a three-hour drive to the Fraser River north of Lytton – on the way Henry Yu shared with us the Chinese history of the places we passed, including New Westminster, Abbotsford, Chilliwack, Hope and Yale. After a make-your-own-sandwich lunch on the river shore, we piled into three rafts and headed downstream to Browning’s Flat, a 19th-century Chinese goldmining site with the rather remarkable stone water races. From Browning’s Flat we continued down river (seeing a herd of wild horses on the way! ), back to Lytton and then back down the valley to Richmond. 11 July: Victoria Chinatown visit with John Adams and Barry McGowan (ANU). John Adams is a local Victoria historian who runs historical (and ghost) tours with his son Chris; John grew up near Chinatown and is currently writing a book on Victoria’s Chinese history. Starting at the Chinatown gate, John walked us past a number of significant Chinese heritage buildings including the Lee’s Benevolent Association and Chinese Public School on Fisgard Street, before we visited the Tam Kung Temple in the Yen Wo Society Building on Government Street. We popped our head into the Loy Sing Company on Fisgard Street, a cooked meat shop that has been in business for more than 130 years (but with changes of owner). We finished our walk by winding our way through some of Victoria Chinatown’s alleyways, including Dragon Alley, Theatre Alley and Dragon Alley. 12–13 July: Research at BC Archives, which holds the provincial records of British Columbia. Although post-confederation (after 1871) naturalisation was a federal function, it was administered on a provincial level by the county courts – hence naturalisation registers, applications and certificates for my BC Chinese are held in the BC Archives. 14 July: Victoria Chinese heritage visit with Selia Tan (Wuyi University), facilitated by John Adams, Alan Lowe (an architect and former mayor of Victoria), Henry Low, Alastair Kerr, and Tzu-I Chung and Delphine Castles (from the Royal BC Museum). We visited the Chinese Empire Reform Association building, which is now a rather gorgeous private residence; the Hook Sing Tong building, finished in 1913, which features a magnificent stained glass dome; the Hoy Sun Ning Yung Benevolent Association building and its Fan Tan Alley shops, which have all recently been redeveloped; and the Lee’s Benevolent Association building. We also got a behind-the-scenes tour of the Chinese Canadian collections at the Royal BC Museum. The Hook Sing Tong Charity Association building on Herald Street, Victoria, 14 July 2016. The association leases out the ground-floor shops and apartments (condos) on the first floor, keeping the top floor for its meeting room and offices. 15–16 July: Research at BC Archives. 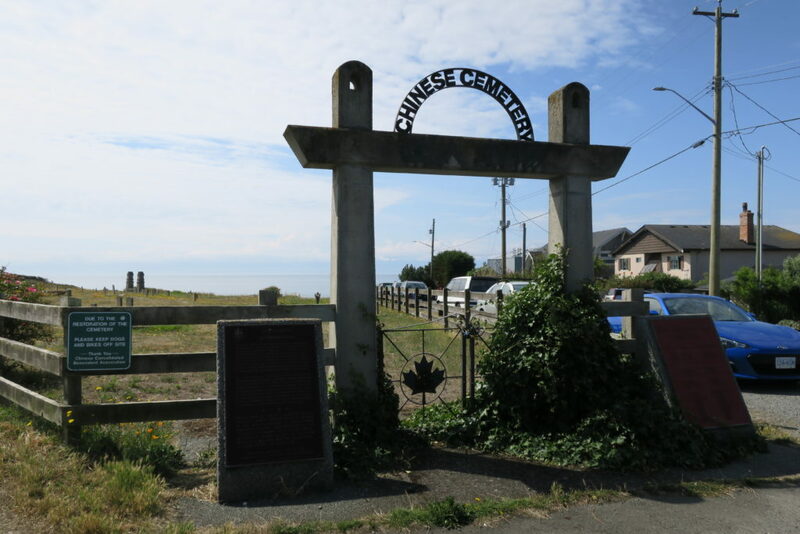 17 July: Visit to Chinese Combined Benevolent Society cemetery at Harding Point, Oak Bay, which is a National Historic Site of Canada. The cemetery was opened in 1903 and officially closed in 1961. 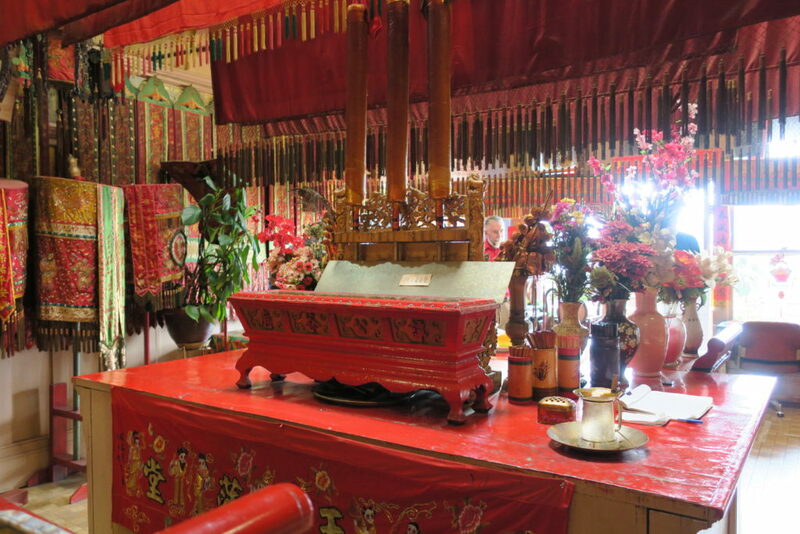 The cemetery is carefully laid out according to feng shui principles. The grave markers sit at the foot of the graves (rather than being headstones) and many inscriptions are solely in Chinese. 18 July: Research at City of Victoria Archives, looking at records relating to several naturalised Chinese merchants of Victoria. 19–22 July: Research at BC Archives. 25 July: Research in the Chung Collection, University of British Columbia Library. 26 July: Research in the City of Vancouver Archives (Paul Yee fonds, and Yip family and Yip Sang Ltd. fonds) and visit to the Museum of Vancouver. 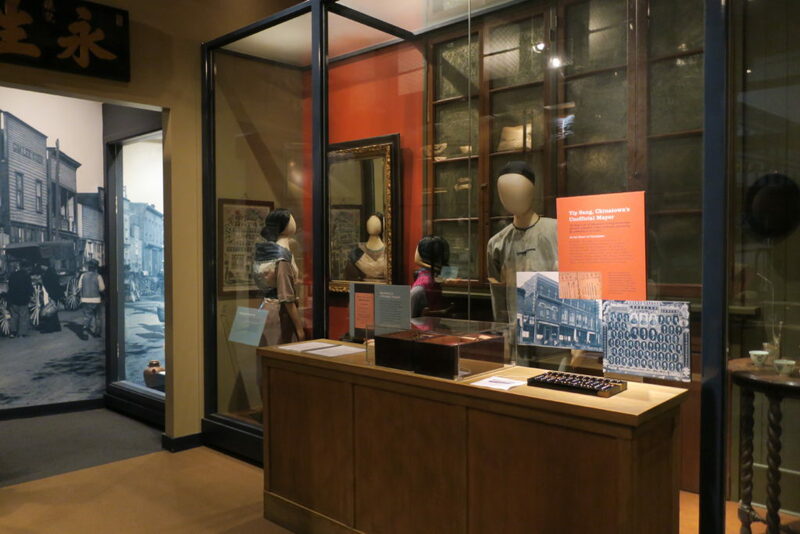 The museum had two exhibits relating to Chinese Canadians on show. The first, which is part of a temporary exhibition ‘All Together Now: Vancouver Collectors and Their Worlds’, was a collection of Chinese restaurant menus from Imogene Lim (see the digitised collection from University of Vancouver Island). 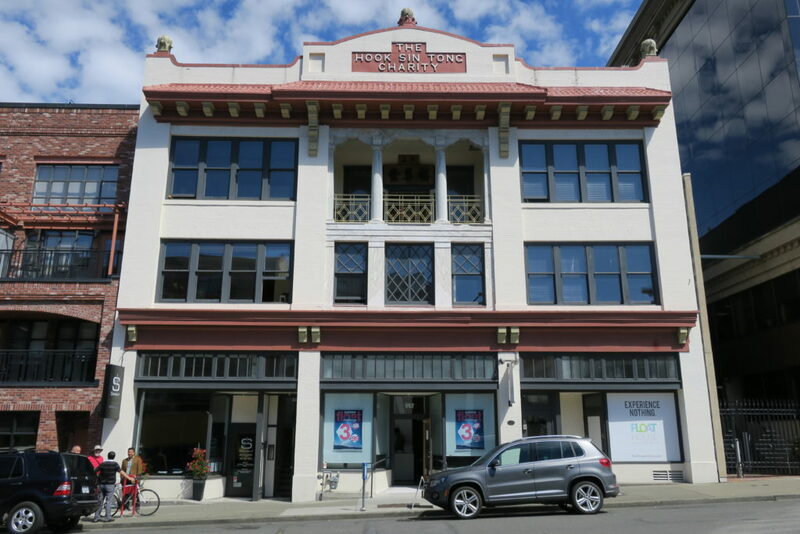 The second is part of their permanent exhibitions and highlights the history of Vancouver Chinatown, and in particular Yip Sang and the Wing Sang Company. The display features a fraction of the Chinese Canadian material they have (search openMOV for ‘Chinese’ or ‘Chinese Canadian’ to see digitised material). One of my favourite things was the fascimiles and translations of undelivered letters found in the Wing Sang building which you could open and read – Wing Sang acted as a post restante service for the Vancouver’s Chinese community. Another favourite was the well-worn silk baby carrier or mē dáai 孭帶 (which you can see on the back of the mannequin in the photo below). 27 July: Research in the Chung Collection, UBC Library, and catch-up with Henry Yu. 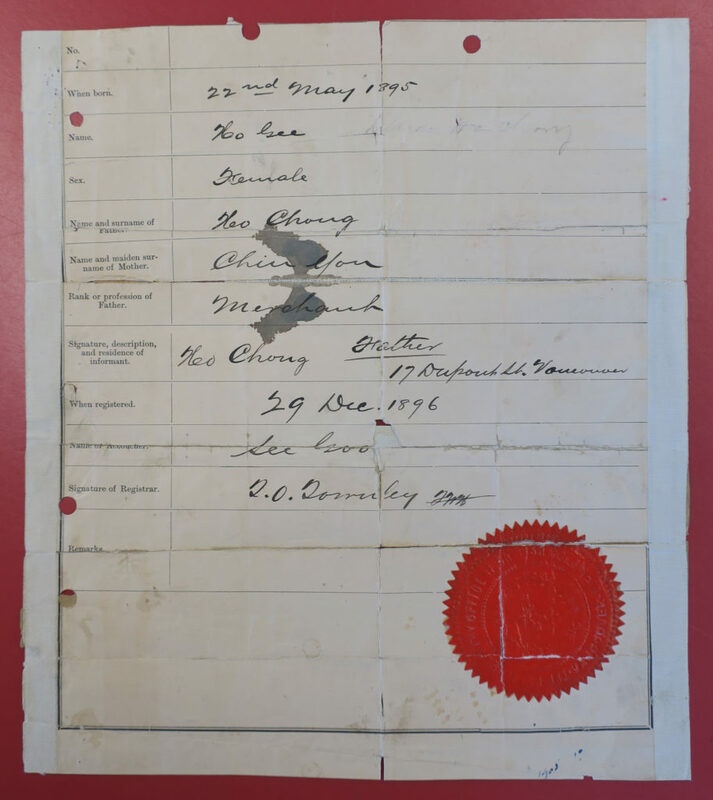 Ho Gee or Lillian Ho Chong’s birth certificate, 1896, City of Vancouver Archives AM1523-S5-2-F004. Lillian’s father was naturalised in 1905 after 23 years in British Columbia.